Caritas Egypt does community outreach in empoverished areas of Cairo. They provide cheap healthcare and vocational training for marginalized and mentally challenged children. Caritas Egypt operates a number of centers in greater Cairo. In Mataraya there is a compound center that serves the neighbourhood and its surroundings. The activities of this center are divided into five sections. Basic clinical services like general medical checkup, oculism, ENT, dental care, among others are provided here. They have a professional workshop where artificial limbs are produced along with other assisting equipment for the disabled like pairs of shoes with different heights to compensate for legs of unequal length. The checkup is free for the poor and costs seven EP for others. Woman development. This section offers a literacy program and second level education for girl that dropped out of highschool. They learn a craft, often against the will of the family who wants them to work and earn immediately. There is also a library free to use for everyone in the community. A section for the mentally handicapped. There are cases of Down syndrome and autism. A training program is put in place that teaches the mentally disabled a craft. For 2-3 hours a day they visit the center, accompanied by their mother who learns about dealing with her child from the experts so she is able to apply it at home. Caritas has a specialized center that trains professional workers and mothers to pass on experience. They give special attention to child rights, and connect families so that they can assist each other. Nearly 25 children live in the center’s orphanage. The Motherhood and Childhood program is the first station where they check everything and often find out about a mental handicap or issues like malnutrition. The center offers lectures for the mothers, and even distributes milk and food. Susan Mubarak, Egypt’s first lady, organized a contest and the center is proud to announce that three of the winners were trained here. The Christian girl who won the drawing competition had drawn Cairo’s most prominent mosque. I think Caritas Egypt does very good work by running these centers, and they could use every support they can get. The Groups for Peace is a grassroots organization promoting the culture of peace by educating the local children through regular sessions. Charity Travel supports the Peace Groups with a donation and the action “Peace of Fruit”, distributing fruits to school children who express their desire for peace. Aim To organize a grassroots peace movement and make sure the Palestinian children grow up with the culture of peace. Staff The Center for Peace is run by two men. 20 people (mostly students) volunteer to organize the peace groups. People reached Each year, 250 children from several villages on the West Bank can take part in the peacegroups. The school we visit for the Peace of Fruit action has 345 children aged 6-12. Contact anonymous to garantuee their safety. You can contact them via me. Since 2001, there is a Center for Peace in a small Palestinian village on the West Bank, operated by two amazing men who both have suffered from the humiliation and the war, but keep striving for peace. 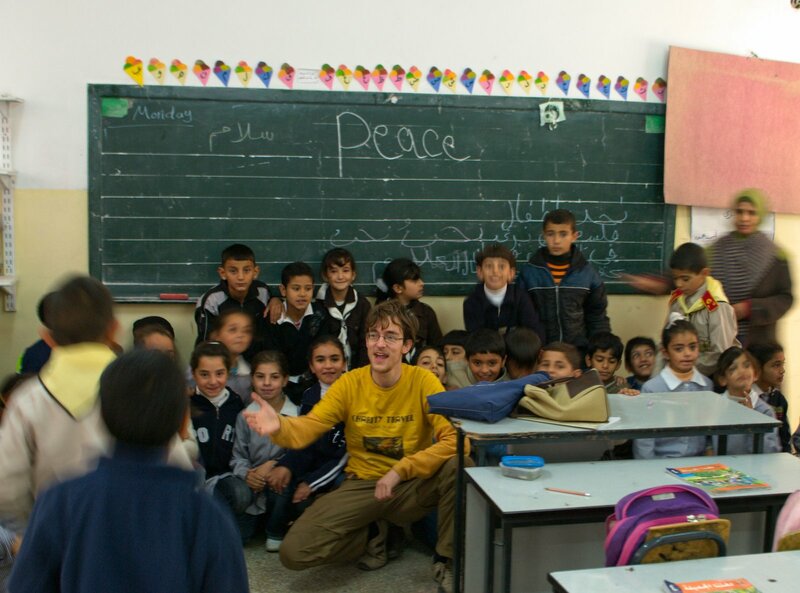 In a small school they have organized Peace Groups and once invited guests from Israel to sit down and talk about the peace. This has already proven effective. This village is very peaceful and is reaching out to the inhabitants of the settlements on the other hill. Unfortunately, the settlers would just shoot them when they enter “their” soil. We strongly support this grassroots peace initiative. Every year, 130 people from this village go to study in Nablus. Engineering and Finance are popular, but some students pick Political Science because they want to be part of the peace process. We support their transportation to and from the university in Nablus. Early in the morning I hand over the donation to a student of Political Science, who will make share it with five other students. We buy fruit for 345 children in the village school for children age 6 to 12. Everybody is helping. There is a truck bringing many crates with fruits from another village, and quick hands put them into 345 little bags, a banana, an apple and an orange for every child. As we drive to the school, a photographer falls from the sky for the second time. It is Lazar, volunteering for the Palestine Monitor and by coincidence in the village to interview the family of a sick child. He offers me to take pictures of the action. So we are welcomed in the school and visit all ten classrooms, where we give every child the fruit. They all smile thankfully, it feels great. I can sense the culture of peace in these moments. In two classes we ask every child to write “peace” on the blackboard in English or Arabic. They are very enthousiastic about it, and so are we. Thanks to Sami and his groups, these children are growing up in a culture of peace, despite the horrors that happen to many of their relatives. We take a lot of photos of the action. I call for every visitor to the country of Israel to come to the West Bank, see it with his own eyes and get involved in a similar action. I believe we can make a change together. Daughters of Charity is an orphan home providing shelter for children irrespective of their religion. They also support female victims of domestic violence. Staff 45 people work at the centre. There are 16 caregivers/nurses, 4 teachers, 2 supervisors. People reached Currently 45 children aged 0-6 live in the crèche; 60 more children come for day care. Capacity is 120 children. Also, there are more than 20 cases of pregnancies of unmarried women each year, who find refuge here. This is Charity Travel’s fastest cause so far. In only ten minutes I am guided around the church complex and take pictures of their good work. A good friend back home in the Netherlands has also vouched for this cause. Daughters of Charity Bethlehem is a daycare center for the most underprivileged children from Palestine territories, regardless of their religion. It also shelters unwed mothers whose life is in danger as they come from a conservative islamic environment. Since 1883, the sisters of Charity of St. Vincent de Paul are taking care of the most underprivileged children in the holy land. In 1895 they established a hospital, now known as the Maternity of Bethlehem.